Emily Kimbrough & Cornelia Otis Skinner also co-wrote books. Do NOT combine this page with that of Ms. Kimbrough or with any of the pages that use both their names. Thank you. 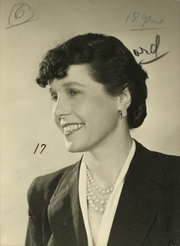 Daughter of American actor Otis Skinner, Cornelia Otis Skinner was a popular actress and humor writer who in later life also wrote biographies and memoirs. Cornelia Otis Skinner is currently considered a "single author." If one or more works are by a distinct, homonymous authors, go ahead and split the author. Cornelia Otis Skinner is composed of 11 names. You can examine and separate out names.